The “F” series: Adjectives and prepositions - Psycholinguistic Technologies, Inc. These workbooks are designed to train adjectives, and also to help build up longer and more complex sentences. The “ F1 Sentences with Single Adjectives” Workbook trains simple subject-verb-object sentences with one prenominal adjective (“The woman is pushing the blue chair”. The “F2 Sentences with Double Adjectives” Workbook introduces a second prenominal adjective(“The woman is peeling the large blue chair” ). The “F3 BUILD Double Adjective Sentences” Workbook provides practice in adding adjectives. Two-picture sequences use materials from F1 and F2 workbooks, so that a sentence with two adjectives immediately follows its simpler counterpart. Comparing the second picture to the first may be helpful because it requires that the user notice some added feature that can be expressed with an adjective. The “F4 Sentences with Single Adjectives and Prepositions” workbook trains sentences with one prenominal adjective and a prepositional phrase (“The dancer is pushing the blue chair into the pool” ). These structures are trained separately in the earlier workbooks of the A series. 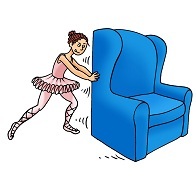 The “F5 Sentences with Double Adjectives and Prepositions” workbook trains sentences with two prenominal adjectives and a prepositional phrase (“The dancer is pushing the large, blue chair into the pool“). These are the most complex sentences in the A workbook series. Their component structures are trained separately in the earlier workbooks of this series.